Hyun-Jin Ryu to Sign Autographs at Viva Los Dodgers Tomorrow! Along with Derrel Thomas, Dodgers starting pitcher Hyun-Jin Ryu will be signing autographs for fans at Viva Los Dodgers from 11:45 AM to 12:15 PM, in benefit to the survivors and families of the South Korean ferry Sewol tragedy. As you know, it capsized in Korea on April 16. There's no word on the desirable donation for his autograph yet, but I suggest being generous. Ryu has already pledged $100,000.00, so this is your opportunity to show your support. Tomorrow, Hyun-Jin Ryu will sign autographs for fans from 11:45 a.m. to 12:15 p.m. at Viva Los Dodgers in lot 6 for monetary donations that will benefit the survivors and families of those who lost their lives aboard the South Korean ferry Sewol, which capsized on April 16. Ryu will sign autographs for donations in the Dodgers’ autograph tent located to the right of the stage and has already shown support for his native South Korea having pledged yesterday a $100,000 donation via his HJ 99 foundation to a charity to help those affected by the Sewol ferry disaster. Ryu will also select a fan at Viva Los Dodgers to throw out the ceremonial first pitch before Sunday’s game. Go here for more information on tomorrow's Viva Los Dodgers event that includes an autograph session with Derrel Thomas (a time has yet to be announced). Also, former Dodger outfielder Kenny Landreau will be signing autographs in the left-field pavilion plaza area. 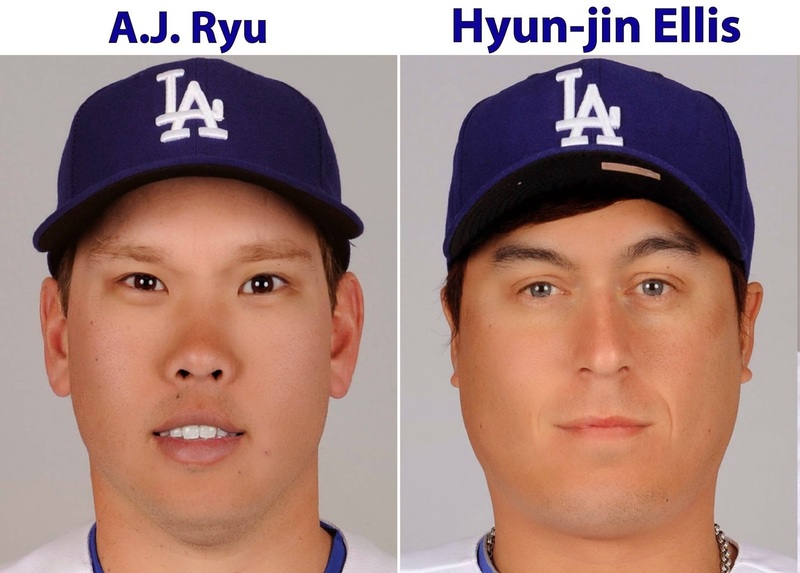 Blog Kiosk: 4/19/2014 - Dodger Links - Some Dodger Face Swaps, Ryu and Manny's Coming Back? Marlon Wayans had some fun with the Dodger PreGame audience yesterday, gif's via Dodger Dugout. Yasiel Puig now has his own official website. Check it out here: The Yasiel Puig.com. Today, @HyunJinRyu99 pledged a $100,000 donation to help those affected by the SEWOL ferry disaster in his native South Korea. Ah... What? Via Mark Polishuk at MLB Trade Rumors, "Several Teams Interested In Manny Ramirez." Via Earl Bloom at MLB.com, "Ellis getting up to speed after knee surgery." "I can do everything, baseball-wise, except run," Ellis said Friday, "and that's not a big part of my game." Via Eric Stephen at True Blue LA, "Tim Federowicz has rough night behind the plate." He got a ball right to the groin.